Rose in Thorns: Handmade Nation is coming to town! Handmade Nation is coming to town! 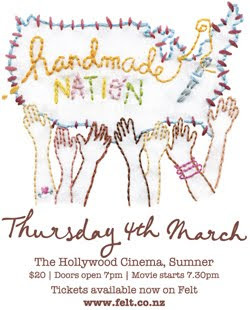 I am looking forward the upcoming screening of Handmade Nation here in Christchurch. The one and only screening will be held on Thursday 4 March at the Hollywood Cinema in Sumner. Come out and support the local craft community, and learn about the new Handmade movement (if you're not already familiar with it!). The lovely Miss Millie, in conjunction with Felt, is bringing Handmade Nation to Christchurch. The doors open at 7pm, with the screening beginning at 7:30pm. Tickets are $20 each, and include a glass of wine and nibbles on arrival – bring your ID if you are lucky enough to look under 25. Tickets are available here from Miss Millies shop on felt. You can also RSVP to the event on facebook, and invite your friends along too.